After boarding the first group of passengers on my Jetblue flight to Santo Domingo in the Dominican Republic, staff closed the terminal door preventing anyone else from entering the jetway. When we were finally allowed to board, we started down the ramp as a TSA agent and his dog were coming from the opposite direction. “Stay to the right,” the agent ordered. The two women ahead of me started to walk tentatively toward the plane door, their eyes fixed apprehensively on the German shepherd as it pulled at the end of its leash, evidently hard a work sniffing for signs of something. Drugs? Explosives? Kibbles ‘n’ Bits? I’d awakened that morning to rain, and as happy as I was to leave that behind for what I hoped would be a sunny three days at Casa de Campo, on the island’s south shore, I worried that inclement weather might also mean flight delays. The flight was delayed, by close to an hour, not so much because of weather—though that, too, played a part—but, as the flight attendant would later tell me, by the thorough search of the luggage of one of the passengers who’d boarded in the group ahead of me—and was seated in the row directly behind me, which is why the attendant hadn’t wanted to talk. I flew into the Dominican Republic’s capital city of Santo Domingo. That’s not the closest airport—La Romana is, but at this time of year JetBlue didn’t have a Thursday flight there. I was met at the airport by Alberto from Casa de Campo for the one-plus-hour drive to the resort, arriving about 5:30 p.m. beneath cloudy skies. 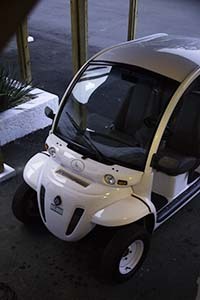 After checking in to a villa, I immediately set out in my golf cart—each villa comes with one—to explore. I hoped to get to Altos de Chavon, a replica of a 16th-century artisans’ village set high above the Chavón River, before dark. Regular villas come with a traditional motorized golf cart; however, villa suites, like the one the resort had given me (I was their guest), come with an electric golf cart. The bellman had showed me how to operate it and pointed to the battery gauge, which indicated that I had full power. I took a look at the map, which seemed to show a pretty-much due-east route to Altos, and headed off. Let’s just say that I did not end up taking the most direct route to Altos (I’ve never had the greatest navigational skills) and managed to explore a substantial part of the 7,000-acre property before finally arriving, well after dark. It was quiet, the cobblestone streets and stone walls softly lighted. A few cafes and bars were open, as was the museum (which I decided to visit later) and a small market. Three well-dressed women arrived shortly after I did, and chatted among themselves at how beautiful it was, even at night. Having a map does not do much good if it’s too dark to see it, so as I made my way back from Altos I once again took a very circuitous route back. In theory, I merely needed to stay on the main road, but in practice I made a few wrong turns onto other seemingly main roads, growing more and more concerned as the power meter on the golf cart edged toward yellow. From time to time I pulled over under street lights to try to determine where I was, particularly after the power meter went into red and I still seemed to be in a very dark part of the resort–headed, I was pretty sure in the right direction, but not at all sure how much farther I had to go and whether I had the power to get there. At last, I was the sign for the main hotel, and managed to get to my villa–and a power source–before completely draining the battery. I needed a drink and dinner, and found both (a $5.50 Chilean cabernet sauvignon and a delicious grouper Livornese) at La Cana in the main hotel along with some great company, tennis consultant Ted Murray, about whom I’ll have more to say tomorrow. At 11 pm, Ted dropped me back at my villa and I went to sleep to the sound of a torrential rain. Would this affect tomorrow’s exhibition?